A daily rhythm is a basic routine or schedule that creates the framework for your day. Following a daily rhythm and weekly routine or rhythm, can increase productivity and help you focus as you flow from task to task. 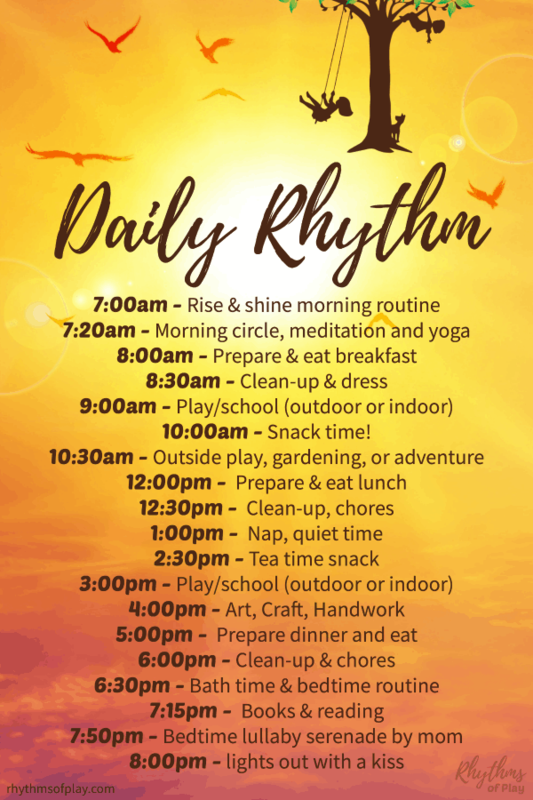 Establish a daily routine or rhythm to ease transitions, get organized, keep your household (or classroom) running smoothly, find the time to connect with your children, and still have time for self-care! 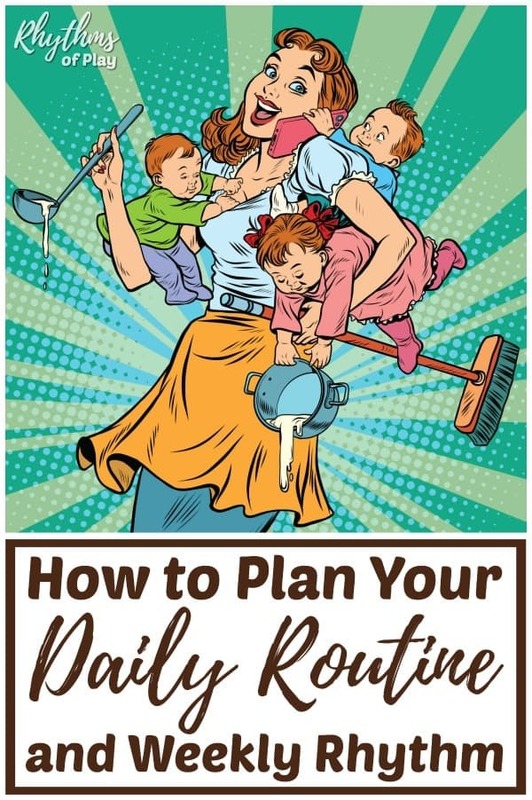 It is more than likely that you and your family already have some sort of structure or routine to your day. If not, odds are you are desperate to create one and that is why you have found yourself here. Without structure, chaos reigns and overwhelm rules your world… At least this has been my experience. A daily and weekly rhythm is a flexible form of time management that directs the basic order of your daily and weekly routines and tasks. It is a lot like a schedule without the rigidity. A rhythm allows for change and flexibility where schedules fall short. Get out a piece of paper, open up a new document, or click on the link to grab your free weekly rhythm planner to get started! Our daily and weekly rhythms are designed to make our most important tasks into daily habits in order to increase productivity. Following a daily rhythm ensures that we don’t waste our time or perform actions that are of no value. Start by writing down a list of everything you currently do or would like to fit into your daily rhythm and weekly routine. This can include daily and weekly chores, morning and evening routines, regularly occurring appointments, time for work, fitness, running errands, completing projects, family activities, and time to play! Establish the main points, or anchors, of your day. These anchors can be meal times, the start and completion of your work day, nap times if you have small children in the house, before and after school, etc. If you have downloaded the free weekly rhythm planner you will see that we have provided several different options to use as anchors already typed in. We have also included a page with the gray anchor spaces left blank if you would like to write in your own anchor points of your day. You will only need to use one of these pages. Chose the weekly planner with the anchor points that best fit your needs and either make a lot of copies or use laminating sheets and a laminator to make a planner that you can reuse with wet erase markers. Rudolf Steiner, the founder of Waldorf education, spoke of rhythm as flowing with the breath. He said that “right rhythm” is a balanced combination of activities where we breathe in (internal activities), and breathe out (external activities). As a yoga instructor, I resonate with the idea that our daily routine should be more rhythmic to support us as we flow from task to task. This also means that our daily rhythm should follow periods of expansion–breathing out–where we relate to the external world with periods of contraction–breathing in–where we relate to the internal world or ourselves. The take home is this… When you create your daily routine, follow expansive or energetic activities with restful activities, and follow these more restful periods with activity. How does following a “Right Rhythm” Help? Right rhythms can help you use to power of habit to change your life. When you perform active high energy activities or passive low energy activities at a similar time each day–your body, mind, and spirit will all be prepared for the task at hand; whether it is going for a walk, doing chores, running errands, eating lunch, meeting with an important client, or going to bed for the night. Over time following a strong “right rhythm” can create good habits and a strong daily routine because your mind and body will be prepared for the type of task you have planned for each moment of your day. 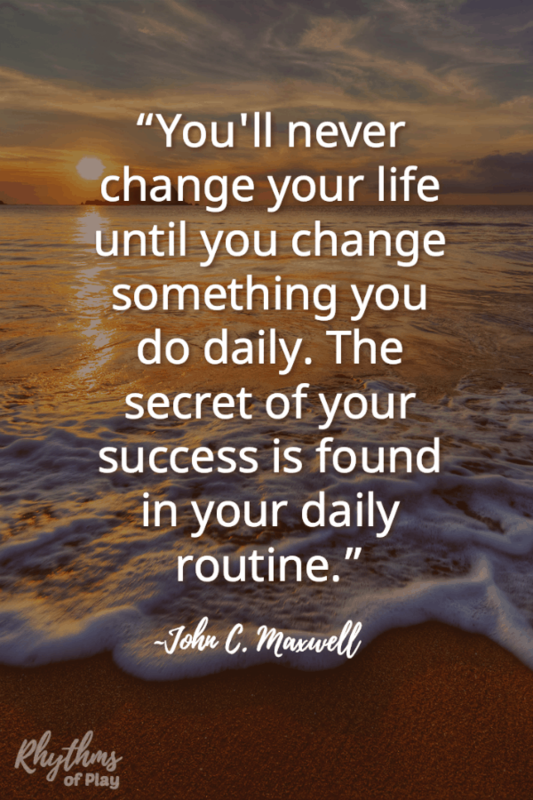 This is how you choose to create the life of your dreams… One habit or goal at a time. Use your planner to write down your basic daily rhythm and weekly routine. The idea is to assign the spaces before and after your anchor points to complete specific tasks (chores, errands, work, exercise) during those times, and to have most of these tasks, excluding singular appointments and events, repeat on a weekly basis. If you are using the free weekly rhythm planner that uses breakfast lunch and dinner as the anchors, you can use your planner as a meal planner by writing the meals that you would like to prepare down in the corresponding spaces. Learn more about how to combine daily and weekly rhythms into one big harmonious whole in household rhythms. I like to think of a rhythm as a series of routines and tasks combined together in a harmonious flow. Once it’s there, you simply let your day unfold around it, allowing your daily rhythm to carry you as you easily move from task to task. The idea is to turn everything that you do on a daily and weekly basis into a habit that you no longer have to think about executing. When you no longer have to think about what you need to do next, you will easily complete your daily to-do’s. This will also free up space in your schedule to do the things you have always dreamed of fitting into your schedule! Take your time, and do your best not to get discouraged. It takes time and effort to establish new habits. Establishing a daily rhythm and weekly routine is one long daily and weekly habit. Once your rhythm becomes a habit it will support you even on the most challenging days. You may not know what to do next, but your rhythm will. Just stay calm and go with the flow. You’ll know when you have found your groove when you move easily through your day without having to look at what comes next or think about your next activity–this is true freedom. A sample of our basic daily routine… our Waldorf daily rhythm! We don’t follow this exact routine minute by minute every single day. There are a lot of variants in our day to day routine and household rhythms, but this generally follows that as we flow from day to day and week to week. Some days flow more smoothly than others. Following a daily rhythm helps the smooth days become more frequent over time. You can find all kinds of fun ways to get through your day as you learn through play on RoP… That’s why we’re here! A few of our favorite ideas to get your started can be found below. The suggestions follow the same basic order as the Waldorf daily rhythm listed above. We have even included a few of our favorite meal options! 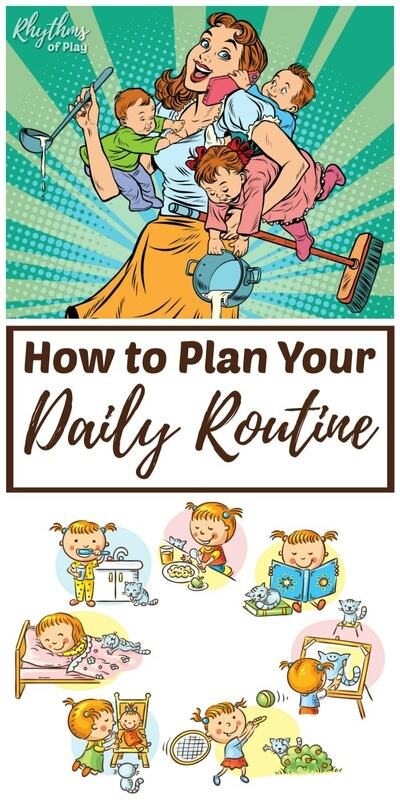 Creating daily and weekly routines and household rhythms can help make it easier for parents, caregivers, and educators to get through each day. Following a daily rhythm or routine can help ease transitions, increase productivity, and get organized for good! Find the freedom within the structure of your day with a daily routine and weekly rhythm that works for you and your family! I’ve learned a lot about the power of rhythm and routine in childcare and education while reading the books below. You may also like Best Parenting Books for Raising Kids Zero to Five and Positive Discipline Books for Parents and Educators. I find a routine or rhythm so important. December was a roller coaster for us with some medical concerns, Christmas, and then all of us getting a horrible cold. It threw off that rhythm. As we are getting back into it, I’m noticing it helping my daughter get back to normal napping, better behavior, etc. I just feel more normal and calm when our days flow. I like creating my own rhythm. Glad to hear it Betty! Have you found it helpful so far? i love your creations… they inspire me a lot! Thank you so much Santana! So glad you enjoy our creations! 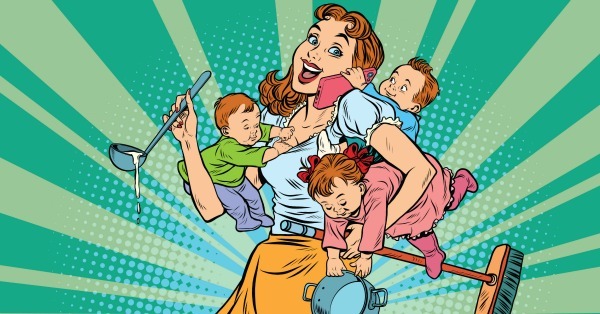 I am a single mom of 3 small children. Our weekdays are pretty well scheduled and balanced but our weekends seem to be all over the place. I always feel like a failure because I am trying to be so structured on weekends and it never works our. I actually think instead of structure and schedule I need to be more flexible with how things happen in the weekends. The weekends for us are unpredictable so I think I freak out when the house doesnt get clean Saturday because we have to attend a birthday party and its hard for me to be flexible with doing it Sunday. I think I need more flexibility vs schedule and structure. Hi Kim, I have had a similar struggle on the weekends for completely different reasons so I get it. I’m a bit confused though… Have you already tried turning your weekends into more of a rhythm and it’s still too structured? Or are you saying that you can’t wait to loosen the reigns a bit with a rhythm instead of schedule?